Sometimes, they say, a picture is worth a thousand words. But this one caused me to read many more than that. Because this isn't the first bobcat I've seen in the Santa Cruz Mountains with bad mange. And I know other mangy bobs have been found dead. So I wanted to understand why. Mange comes from mites, which are tiny spider-like critters a bit like mini ticks. And there are a variety of species, each resulting in a different type of mange. Some live on the skin surface, some in follicles, others burrow. Some are animal generalists, such as the eastern chigger, and others host-specialists, only targeting canines, bovines, felines, primates, or avians. Some live their whole life cycle on their host, others just a phase, or to feed. The bobcat in the above photo has Notoedric mange, also called Cat Scabies. It comes from the burrowing mite Notoedres cati, and is the feline equivalent to the Sarcoptic Scabies people and dogs can get. And while it isn't known to infect dogs or people, for house cats and bobcats it can be contact-contagious and deadly. Because if the affliction gets too heavy a downward spiral can begin: the skin swells and cracks and gets bacterial infections, the animal's senses become impaired, deep malnutrition sets in, the infections move into its blood, and - systemic shock. But here's the big worry: mange is pretty much always a secondary condition. Most animals are constantly carrying a variety of mites, but don't get "mange" (which is the clinical term for the condition when an animal reaches a high level of skin affliction from mite bites). Their normal diet, hygiene and immune responses keep mite spreads at bay. Meaning there's something worse wrong with these bobs that's keeping their immune systems from suppressing the mites to their normally low, livable, non-visible, non-mange levels. Malnutrition can lead to all sorts of health issues, including mange, but it too will have another root cause, such as not getting enough or the right food, or internal parasites. 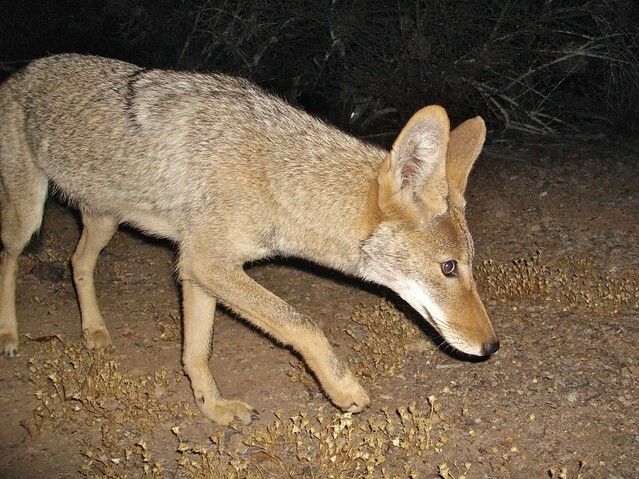 Which is why it's much more common in canids, such as coyotes, that, much like our dear doggies, will happily eat garbage and roadkill, and roll in anything and everything stinky and scatty and maggot-ridden they can find. And goodness, can they find. 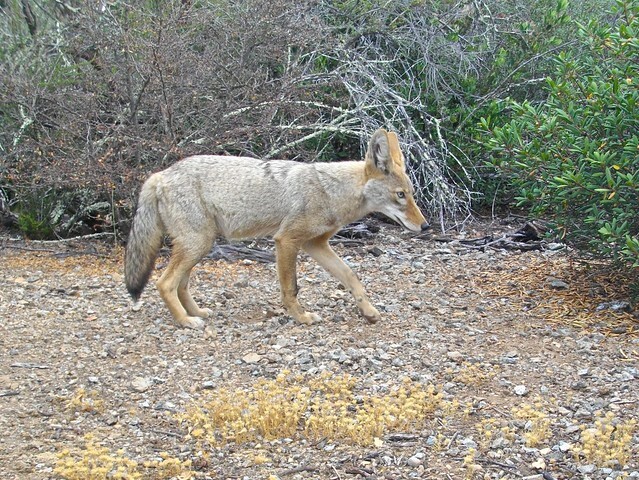 But unlike our dogs, coyotes don't have flea collars and Frontline and Heartgard, so pretty easily get poisoned, parasites, and other immune-compromising sicknesses that can allow their various flavors of mange mites to spread and take hold. But bobcats, like house cats, are both hygienic and finicky eaters, and really don't do garbage or even carrion. 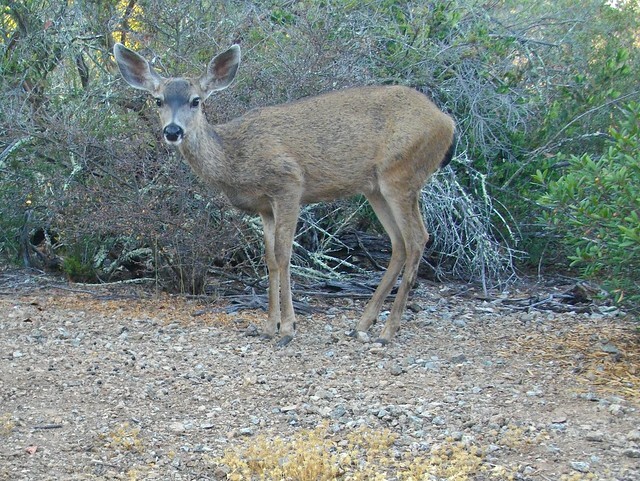 And prey abundance isn't ever an issue in the Santa Cruz Mountains, even during drought years. There are healthy bobcat snacks aplenty in the area. Diseases can crush an immune system and enable other afflictions, but diseases in bobcats aren't all that common. They can get the Rabies virus, but animals generally die far too fast from it to develop mange. And if there was a slow-acting disease going around, would we be seeing healthy and sick animals of the same species in the same geographical areas? That brings us to poisons. 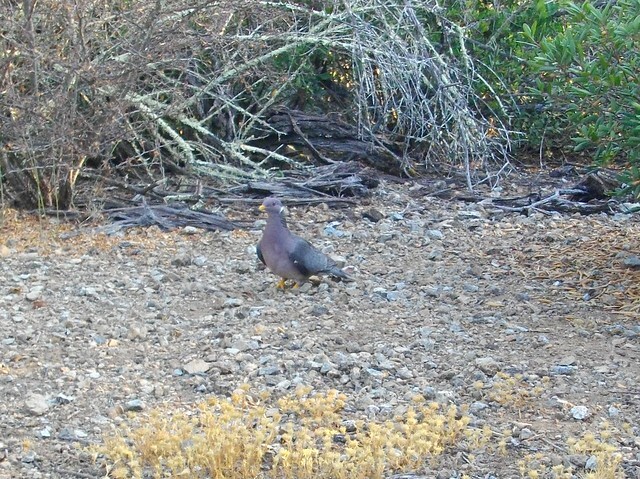 As we know from the Cal Condors, carrion eating animals can get lead poisoning. But as mentioned, bobcats don't really do carrion, such as gut piles, and definitely not in the amounts needed to get sick enough from lead to get Notoedric mange. 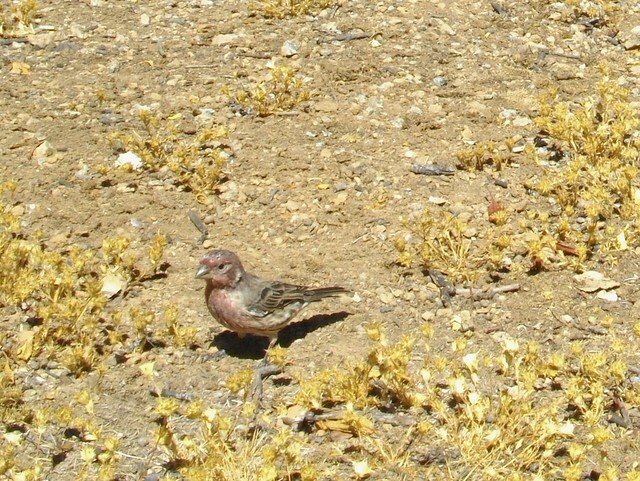 Pesticides and herbicides can wash into water sources and also cause wildlife sickness. But that shouldn't be as here-and-there in the species affected. 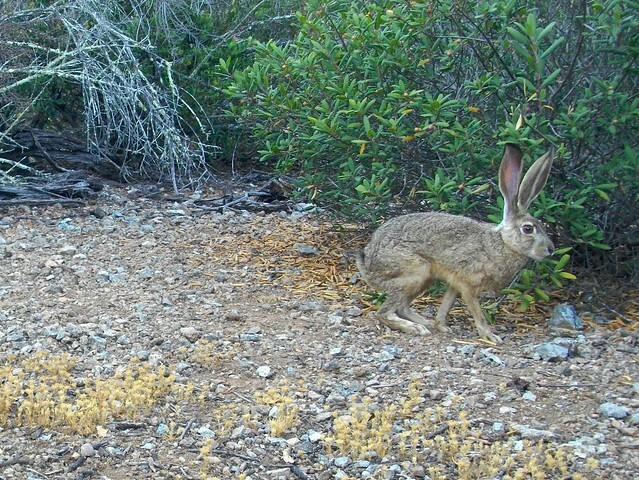 I would think something in the water would be seen much more uniformly across the rabbits, hares, woodrats, and birds, as well as the deer and coyotes living coincident with the affected bobcats. No, not disease or standard poison sources. The best fit for what's happening to this bobcat and others in the Santa Cruz Mountains is a problem being seen elsewhere in California - secondary rodenticide poisoning. 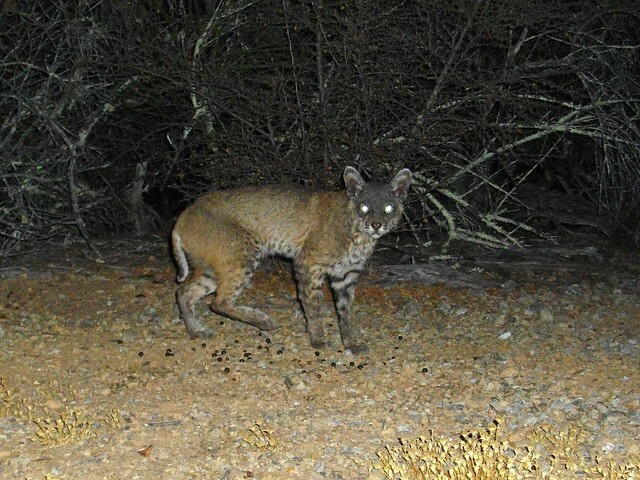 Seems that Notoedric mange in an area's bobcats may be a key sentinel. 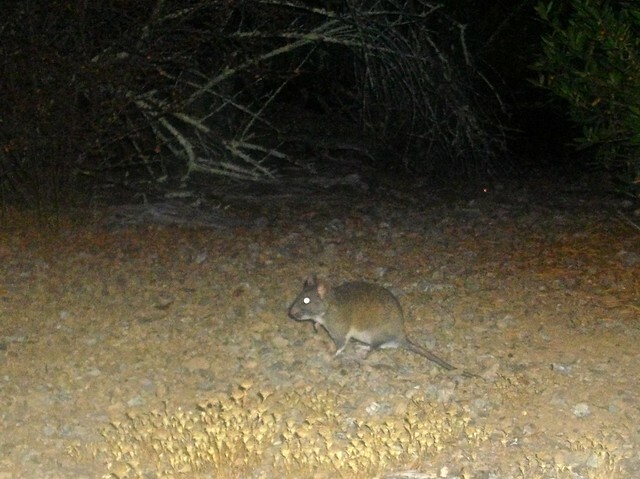 It comes from a class of rat poisons called anti-coagulants, and especially the ultra-strong Second-Generation Anti-Coagulant Rodenticides (SGARS). Many of which are commonly used for killing pesky rats, mice and ground squirrels around houses, farms, gardens, nurseries, wineries, cemeteries, chicken coops, barns, pastures, orchards, and - unfortunately - illegal pot grows. "Ranger - why is there a hairless sick bobcat lying on the trail?" And it's only seen in certain animals because those happen to be the lucky individuals with home ranges in the contact zone of human habitation/cultivation where the rodents might be running into these harsh rodenticides. Bobcats living well away from those areas rarely show mange. Personally, I've always been wary of pellet poisons. Even for snails, and even with special dispensers. I just always wondered what else might eat the pellets or poisoned snail or rat. The chain of custody is just too weak for my tastes. But I've never had really tough pest problems. Yet I also know that when people buy stuff like this, they also kinda expect that the safety and impacts have been more researched and sorted out. When you hand someone a gun it's generally polite to say "don't point that end at your face." "Rats and mice may consume a lethal dose in one night's feeding with first dead rodents appearing 4 or 5 days after feeding begins"
May consume a lethal dose? And where is the rodent during those 4 or 5 days? Or thereafter? 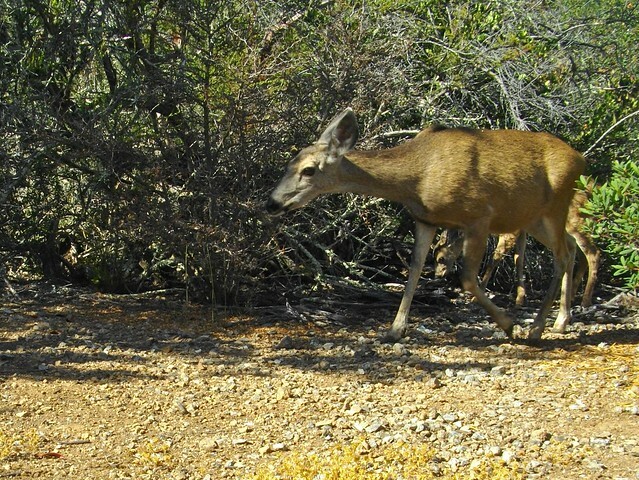 Perhaps there are other/multiple root causes of the Notoedric mange and death of these bobcats and the other wildlife that often eat small rodents in the Santa Cruz Mountains. But seems to me the evidence from here and elsewhere in CA is more than worrying enough to suggest that these pellet-style rodenticides are too risky and unknown to be sold and used so casually. I.e., it might be time for us to draw a red line when it comes to the use of these chemical weapons. In fact, the California Department of Pesticide Regulation wants to do just that. The proposed new restrictions on SGARS are posted and open for public comment until October 4th 2013. 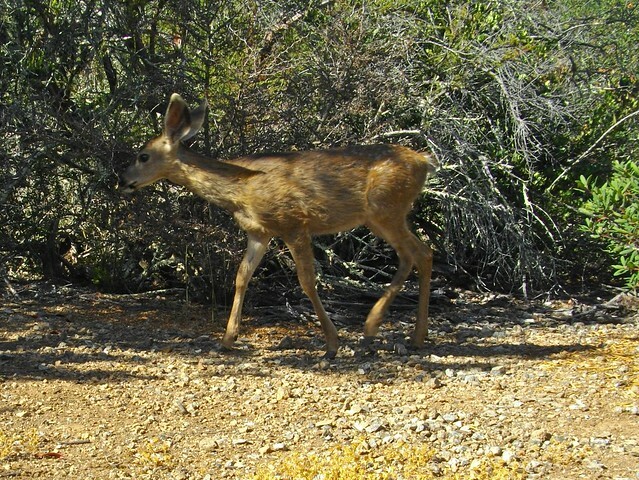 If you're associated with any wildlife and conservation groups, parks, agencies, or like in California, you might see if they've sent a letter on behalf of the organization to the CA Dept. of Pesticide Regs in support of the restrictions. I've also included a bunch of links below from other good orgs, blogs and newspapers working and reporting on the issue. Also, please let me add - if you see a sick/mangy animal in a park - stay away from it and be very, very careful. Compromised animals can be unpredictable and dangerous. d-CON: The risk to your pet depends on what type of pet it is, how big it is, what type of bait it has consumed, as well as how much bait was consumed. If my pet eats a dead rodent that may have eaten the rodent bait, will it die? d-CON: The potential of any secondary poisoning depends on what type of pet it is, how big it is, what type of bait it has consumed, as well as how much bait was consumed. Well researched post. Scary to ponder the potential far-reaching threat to wildlife populations. Good informative post, RT. A great pics, too. I live and work on the wildland-urban edge and have seen a number of very sick or dead bobcats in the last few years with severe mange. The first time I saw it several years ago, I was horrified on the inside but on the outside I said, "Yah, it is tough being a wild animal but that is part of the natural cycle." Then we learned about the connection with rodenticides and saw more and more pitiful bobcats with rough coats, bleeding faces and too weak to move away from the trail. I feel awful about my initial ignorance but now we tell neighbors, hikers, other park agencies about the hazards of these rodenticides and encourage them to try other options. When I tell people about this problem with rodenticides getting into the wild predators, they typically say things like "I had no idea" or "I wish I knew that before I set out that bait station in my yard." This week I checked several retail and hardware stores near the parks and found these products available for sale in bulk packages. The instructions are vague about how they might affect wildlife or your pets, how to reduce that risk by where you place the bait, and the warnings are only in English and Spanish whereas we have people of many different languages in the San Francisco Bay area. Even the non-anticoagulant rodenticides can poison wildlife, so watch out for those too. We went back through our photos of busts of illegal marijuana farms and found numerous boxes and bulk bags of these same rodenticides being used indiscriminately in remote wild areas. People want to protect their families and crops from rodents but they also want to know all the info and how to avoid killing wildlife. It's a huge problem RandomMan and I am glad you are sharing info about it. A very thought provoking post. 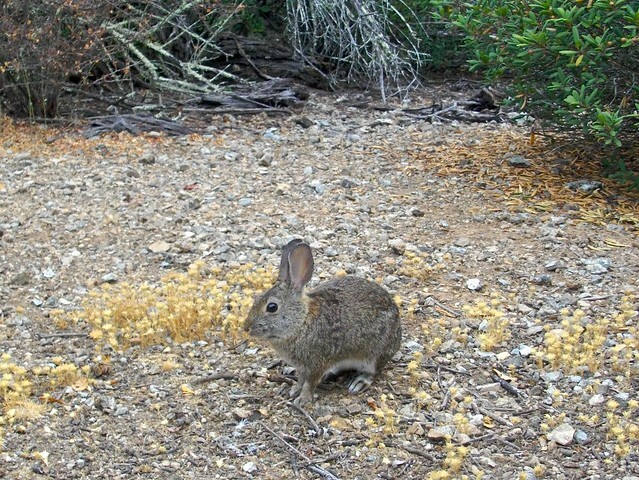 Even though humans dont eat many rodents except maybe the occasional rabbit. You gotta wonder what the secondary, and long term effects of all these poisons have on humans? It is an interesting question John. Because some of the studies are finding build-up of the anti-coags in mtn lions, too, which is pretty high up the food chain. The stuff should be banned. It kills humans, too: http://www.ksbw.com/news/central-california/hollister-gilroy/agriculture-commission-investigating-watsonville-pesticide-death/-/5738758/21130532/-/qqngev/-/index.html. He obviously had other problems, but still. Excellent post. 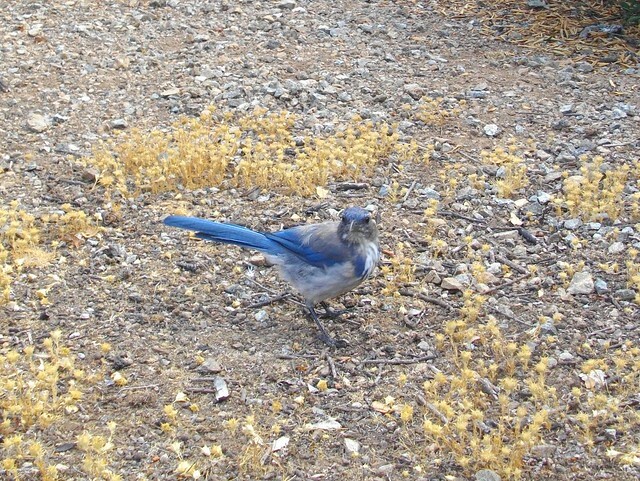 I saw something similar in the Santa Monica mountains when I was working with bobcats there about 10 years ago. Lots of cases of severe mange and if we could get a blood sample the blood didn't clot very well - a good sign of secondary rodenticide poisoning. These anti-coagulant rodenticides are cruel to the rodents and cause a great deal of harm to other animals in the area. I agree that we should ban there and, if needed (and it often isn't really needed, these are used prophylacticly), come up with an alternative method of rodent control. Thanks much. Some of the work in SoCal around LA is the best in the state, and really shedding light on the issue. I want to thank you for your link to “Death By 1000 Cuts”. We really need to spread the word that the unrestricted use of rodenticides is devastating the heath of our ecosystems. I find it sickening when I walk through Lowes, OSH, Safeway and see rows of unregulated “rat poison” for anyone to put out, all in the name of convenience. The irony is not wasted on me, the predators we need are being hit hard by collateral damage thus the “need” for more rodenticide to control “pests” in our homes and ranches. It truly brings tears to my eyes to see some of the devastation we humans unleash without much though or understanding. This is an issue East Bay Puma Project and Bay Area Bobcat Study will spend much time researching and educating folks about. I know this will date me and there is an entire generation that will have no idea what I am saying but in the early 60’s DDT was the end all for insect pest elimination. Well that just about killed off our National Symbol the Bald Eagle. See Silent Spring. Seems humans are short sighted and are doomed to make the same mistakes over and over. Thanks much David for spreading the word. Hopefully the ban will pass and we can get the stuff off the store shelves soon. Thank you for this excellent post, RT. Rat poisons are so bad for so many animals. Excellent post on much needed information and classic example of how predators are affected by toxins in the food chain. No doubt that these poisons should be removed from the market. Thanks Owlman. I agree, of course. And the thing is - you know the chemists can figure something else out. And would want to, if the company stepped up instead of trying to protect their cash cow. Please leave a comment, thought or question at any time. Stories and scribbles on my interactions with the natural world. Regularly features my wildlife research and general addiction to field biology and botany (including the use of camera traps to inventory and document wildlife), as well as tales and natural history from the incredible California lands I'm lucky to wander and work on - in the Tehachapis, the Mono Lake Basin, the Carrizo Plain, and the Sierra Nevada and Santa Cruz Mountains. I can be contacted via the email randomtruth at gmail dot com.